I made my network television debut on last night’s Nashville. Except there’s no way you’ll find me anywhere if you watch the episode. A few months ago, during a trip to Nashville, I pulled some strings to get the privilege of working as an extra for a day on Nashville, a silly soap with great music that I love. My fellow fans Julie Armstrong (also my sister) and Sean Skyler (her boyfriend) came with me. I’ve been on sets before as a reporter, but I’d never been an extra. I thought about pitching it as a story to one of the outlets I write for, but in the end, I decided I wanted the full extra experience. I got it. The day reinforced something I already knew, but it reinforced it harder than ever: A lot of damn work goes into every moment of television you watch; so much that it’s shocking so much television gets made. We started the day with an 8:30 a.m. call time. We were asked to dress “Nashville chic” because we were playing “backstage VIPs.” We had to bring a change of clothes in case the costume folks didn’t like our first choice. They really did check every single one of us, and style us a little bit. They asked me to tuck in my shirt a certain way and push up the sleeves. They had my sister change out of her plaid shirt into a dressier sweater. For about four hours, we walked. Back and forth, over and over, via slightly varying routes, in what was deemed the “backstage” set. 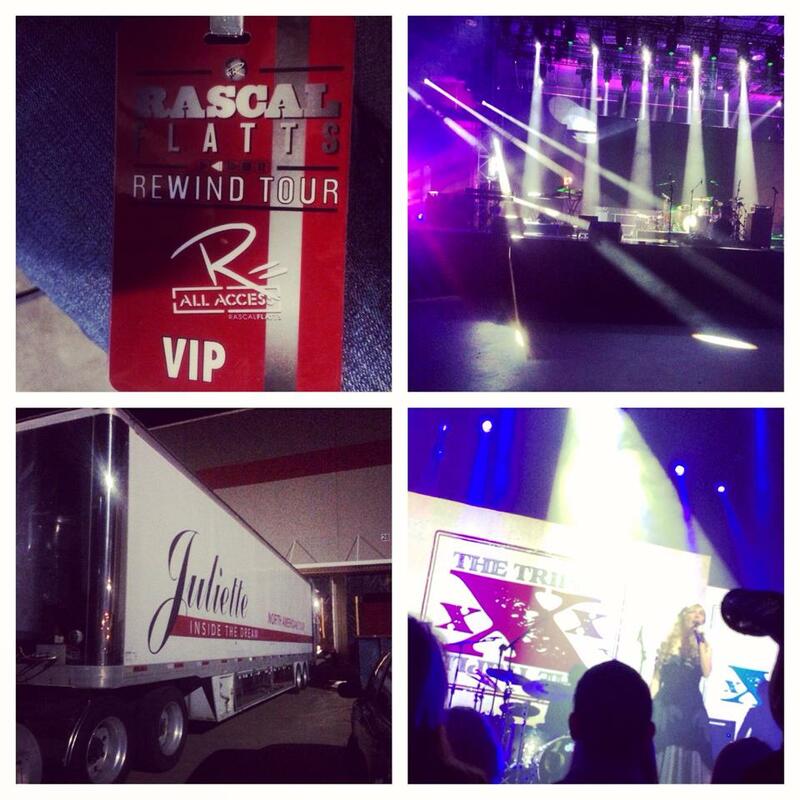 We were VIPs at the Rascal Flatts show where the fictional band The Triple Xs were opening. We were given cues and motivation: We were to be relatively uninterested in the fictional band members during the earlier scenes before their sets; we were there to see Rascal Flatts. But once the Xs had played their set, we were to be impressed and interested in them. It was seriously exhausting. They had production assistants assigned to small groups of us, directing our moves and genuinely concerned if the scene looked “a little dead” in terms of extra movement. All of this translates to this: One of the blurs you saw in front of the camera, walking by as Avery talked on his cell to Juliette, was probably one of us. By the end of our first four-hour shift of doing this, we were starving and needed the restroom like nobody’s business. Luckily, back at the holding room, they had lots of snacks (and later a meal), drinks, and porta-potties. For the next three or four hours, numbing boredom set in. This was alleviated only by our chatting up a woman sitting near us. Her name was Kathy Meredith, and she was a kick. It was her first time as an extra, too, even though she’s a local. She’d grown up in Nashville and had amazing stories. She’d had the chance to go to what turned out to be Elvis’ final birthday party when she was a teenager, but she declined because she was a good girl and knew she couldn’t stay out all night. She works as a flight attendant, among several jobs. Her husband and son have driven music-tour buses for a living. She impulse-bought a stunning Antebellum mansion — we saw video of it — that she hopes to turn into a bed and breakfast. After this storytime break, we finally got to go back to the set, where we now played audience members with a much larger pool of extras — maybe 300 or so. It was fun to see it on the episode last night, with the smaller audience presumably CGI-ed to look much bigger, like an arena audience. By the end, we’d put in a 12-hour day and were exhausted — just to make sure a few blurs passed in front of the camera at the right time, and a bunch of blurs were in the audience for the concert scene. But even in the moment, we were glad we’d done it. (We did also get paid for our time; about $75 after taxes for the day.) Watching the episode last night, I thought about how hundreds of people had put in 12-hour days, and dozens of people had put in many, many 12-hour days, to make that one episode of television. Notice the background players when you watch shows. I always do now. I’ll have to rewatch last night’s episode now. Very cool … and profitable! I love Nashville! It was dropped half – way through the first season here, (New Zealand.) I was gutted! But luckily it returned to our screens after fans and TV critics campaigned for its return. Great post! That sounds like a great learning experience actually. As a skills trainer by profession I tend to look for the opportunity to train. Now that you know what to expect, maybe bring something else to work on or a device to work on your blog. Either way I think you have just witnessed the facade of the entertainment world. Behind the mask there is a lot of tasks that take place for just a few minutes of audio or video product. For example, my team works two weeks for just 30 or 45 minutes of video training. I hope you find the success you are looking for, but would only caution you to always stay close to your roots and God. My daughter is in Nashville right now. She loves singing and is pretty talented, but they are just on a school trip so I hope she gets to see how the magic of music is put together.